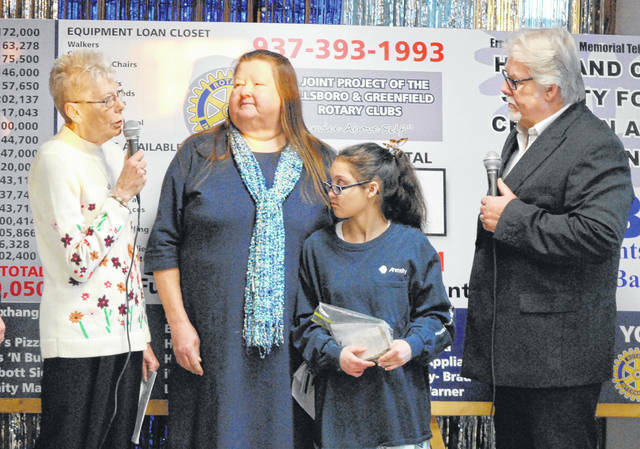 The poster child for the 2019 Ernie Blankenship Radio-Telethon for the benefit of the Highland County Society for Children and Adults, Emily Davis, second from right, is shown at the annual event with her aunt, Pam Chaney, second from left. Also shown are Gayle Coss, far left, and Herb Day, far right. PHOTOS: For more pictures of the radio-telethon, go to timesgazette.com or pick up Friday’s paper. The 47th annual Ernie Blankenship Radio-Telethon raked in nearly $99,600 for the Highland County Society for Children and Adults, and more is expected to arrive in coming days. The program, held in both Hillsboro and Greenfield and sponsored by those communities’ Rotary clubs, provides the society with funds for assistance and services to Highland County children and adults who have extraordinary expenses for necessary medical treatment, transportation, equipment and other health care devices. Judge Rocky Coss, a Rotarian who runs the event, reported Wednesday night that the latest donation count showed $99,578, including $5,175 from the Greenfield event. Coss added that organizers hope the final count will exceed $100,000. Wednesday’s donations topped a total of $3.75 million raised since the event’s inception in 1973 when its namesake, longtime local radio personality Ernie Blankenship, hosted the program. In absence of Blankenship, who has since passed away, local radio personality Herb Day and auctioneer Rick Williams hosted the event in Hillsboro, interviewing groups of donors at a crowded Merchants National Bank. Laughter and chatter filled the air at Merchants as a line of donors at times stretched out the door of the bank and spilled out into a sunny evening in uptown Hillsboro. Poster child Emily Davis was also on hand at the event with her family, and Coss said the youngster herself raised $2,100. Davis, who Coss said has a disorder that prevents her from both digesting food and feeling pain, asked for donations to the society instead of birthday gifts when she turned 13 this year. “She’s a joy to be around and she’s happy to participate,” the judge said. According to Coss, the larger contributions Wednesday included $15,000 from the Cassner Foundation, $10,000 from Merchants Bank, $3,000 from US Bank, $2,500 from NCB, $3,000 from the Hillsboro Eagles and $1,800 from Highland District Hospital. The event also included a memorabilia auction, which brought in nearly $2,000. • A black and white photograph of Frank Robinson and Oscar Roberson, autographed by Robinson, which sold for $525 to Darrell Wilson. • A copy of a photo of former Cincinnati Bengals running back Icky Woods from one of his TV commercials, which sold for $75. • A Geno Atkins commemorative football, which sold for $50. • A Johnny Cueto Cincinnati Reds Bobblehead, which sold for $25. Coss thanked Terry Mikkelsen, who streamed the event on Facebook and YouTube; Rotarians from Hillsboro and Greenfield for organizing the event; Charlie Guarino and Richard VanZant for special assistance; the Cassner Foundation, which has been the top donor throughout the event’s history; local banks for supporting the event; and the many businesses, community groups and individual donors who made contributions to the society. Coss said checks can still be dropped off at any uptown bank, made out to HCSCA. Sponsors of food, advertising and signage for the event included Big Ernie’s Pizza, Larosa’s Pizzeria, Holtfield Station, Ponderosa Steakhouse, Pepsi Cola, Subway – Brad and Melissa Elmore, Community Market, Alley 21, 24 Deli Exchange, Blossoms & Buds, Rick’s TV & Appliance Center, Time Warner, iHeart Radio, Chad Abbott Signs and East Main Flagway.